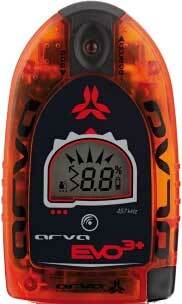 The ARVA Evo3+ was discontinued in 09/2015. Summary: The Evo3+ is identical to the ARVA Evo3, but it indicates if there is one, two, or more than two victims whereas the Evo3 showed if there was one or more than one victims. Early versions of this beacon supported the marking of a multiple burial by toggling the "nose" switch. In late 2013 a dedicated "mark" button was added as well as the option to purchase the transceiver in red or orange. The Evo3+ was replaced by the Evo4 in 2015. Multiple Burials: Searching for multiple burials with the pre-2013 version of the Evo3+ is similar to the multiple burial features in the Evolution+ and Evo3, except the behavior when you toggle the "nose" is different. In the Evolution+ and Evo3, toggling the nose activates a "scan mode." In the pre-2013 Evo3+, it "marks" (i.e., ignores) the current signal. (The transceiver displays "CE" momentarily after toggling, and then again when you get halfway to the second victim.) A dedicated "mark" button was added to the Evo3+ in late-2013. As with the other ARVA Evo harnesses, you'll have to remove the harness from your body before you can perform a fine search. The Evo3+ is an easy to use beacon with a relatively short reception range and less than intuitive multiple burial marking. Pros: Improved multiple burial features (compared to Evo3). Cons: Similar to Evo3's "cons".